Excellent forms. Selected materials. Innovative ideas and perfect design are characteristics of the cherfandraperies product range. 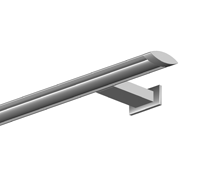 Curtain Poles from cherfandraperies also meet this standard. Each detail is well-thought-out, every idea is consistently checked for its functionality and implemented in tailor-made solutions. Both the language of forms and the selected materials set accents in the room and trends in the design. 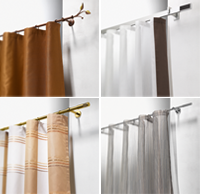 From classically elegantly to ornamental to minimalistically pure, they hold your curtains and give them character. The range is large, like the force of expression of the materials and material combinations. Innovative forms in aluminium, individual solutions in V2A steel, sensuous language of forms in brass and hand-forged iron. Quality materials – aluminium, brass, V2A steel and iron – underline the style of your choice. Innovative forms, as in the case of the ‘Skalar’ curtain Poles with its unusual elliptical design, are exclusive in-house developments – as is the innovative material mix of lacquered wood and aluminium in the ‘System’ curtain Poles.